Think you have to compromise on safety when you’re a reimbursement fleet? Not if you’re a customer of Motus, the Boston-based giant in vehicle management and reimbursement. Over the past 10 to 15 years, fleets have been discovering that fleet safety is the last great frontier for reducing fleet expenses. Since then, industry suppliers of fleet management services have been competing with one another to broaden and deepen their array of offerings that prevent accidents, protect drivers and the public, and reduce the associated costs of collisions. The aim for fleet management companies has been to become a one-stop shop for all fleet services by bundling driver safety services with all of their other offerings, and a number of FMCs have come a long way to fulfilling that role. By contrast, reimbursement fleet service companies have lagged behind that trend. Now Motus is not only meeting the challenge, but it in some respects is surpassing some FMCs in the bundled safety race. Over the past two and half years, Motus has rolled out significant upgrades in two key fleet safety dimensions: motor vehicle record (MVR) reports and its approach to online safety lessons. The Motus approach to safety starts with a driver assessment test, a 10- to 15-minute online training module followed by a multiple-choice exam that reveals attitudes that correlate to how likely it is a driver will exhibit risky on-road behavior. Its second component are color-coded reports that sort drivers into one of three risk levels (low, medium and high) based on scores derived from their most recent motor vehicle reports. Fleet administrators access driver scores through the Motus digital portal. The MVR report screen shows complete data on every violation, including the kind, date of issuance, whether the driver was convicted and, if so, on what date, the points the driver has accumulated, as well as the status of the license (active, suspended, withdraw). Since different jurisdictions often assign different point values for the same offense, Motus has normalized driver scores by assessing a point value for infractions. On the Motus system, drivers with zero to two points are rated low risk, those with three to 14 points medium risk, and those with 15 or more high risk. On the administrator screen, low scores are highlighted in green, medium in yellow and high in red. The screen is sortable by color and point score so high-risk drivers are easily identified. Motus has added two more MVR-related enhancements: drivers’ license status and custom data ranges. Now, fleet administrators can filter the license column to see if anyone’s license is “suspended” or “valid”. Fleets can also limit the number of look-back years of violation history Motus reports – some states routinely report up to 10 years of history, well beyond the number that fleets want to use to score a driver. To improve driver behavior, Motus has created a 12-month curriculum of online driver safety lessons, which all fleet drivers are required to pass, covering every major category of safety practice, from speeding and distracted driving to backing up. What’s unique to Motus is how it delivers those lessons. First, every driver’s lesson sequence is tailored to his or her strengths and weaknesses, based on their initial assessment. The Motus learning system automatically assigns lessons first on those subjects where a driver is weakest, in order to address the most urgent risks in the timeliest manner. No matter how high or low a driver’s risk level is, all drivers take a monthly lesson on all 12 topics every year, year after year. To avoid monotony when lessons are repeated, Motus also changes lesson content every year. 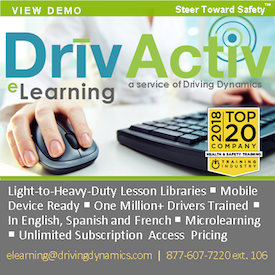 The company has created 40 different questions on each topic, but includes only 10 per lesson, so the content is different each time a driver takes a lesson on a given topic. In addition, Motus continually updates the questions to reflect any new developments in the field. 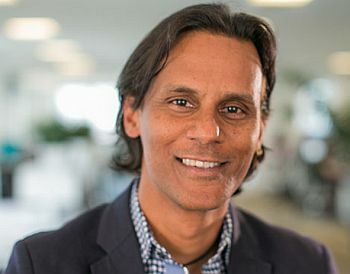 Ady Das and Nimit Patel are, respectively, vice president and director of product management at Motus. As much as Motus has upped its safety game, they say that more enhancements and new offerings are on the drawing board. For example, Das says that in 2019, Motus expects to introduce a driver violation alert feature and to roll out continuous MVR monitoring, which will provide monthly updates as states provide new driver data. Further down the road, Motus is also considering integrating telematics event data into its driver scoring system, Patel said.